Russia-backed militants increased the number of ceasefire violations in eastern Ukraine yesterday: they conducted a total of 25 attacks including the ones involving 82-mm and 120-mm mortars. Ukrainian troops returned fire 13 times. 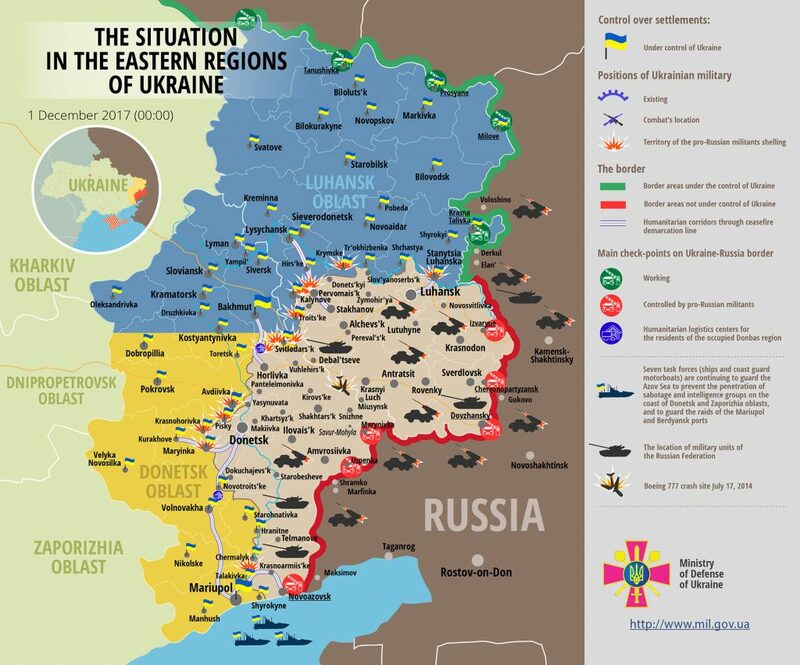 “One Ukrainian serviceman was wounded in action yesterday during a hostile attack near Pisky. The serviceman was quickly evacuated to a hospital,” reported Colonel Oleksandr Motuzyanyk, Ukrainian Ministry of Defense spokesman on ATO, at a press briefing at Ukraine Crisis Media Center. In Luhansk sector, Russia-backed militants violated the ceasefire 16 times. Militants had been attacking Ukrainian positions near Luhanske and Troitske with mortars of various calibers from 01:00 till 03:00. “Ukrainian positions near Krymske and Novoluhanske came under mortar fire during the day, the positions near Novooleksandrivka came under fire after 21:00. Ukrainian troops recorded a total of 16 explosions of 120-mm mortar rounds and four explosions of 82-mm mortar rounds in Luhansk sector,” said Colonel Motuzyanyk. Moreover, Russia’s proxies fired used IFV mounted weapons near Lozove and Luhanske three times. “Ukrainian positions near Troitske, Stanytsia Luhanska, Zhovte, Zaitseve, Luhanske, Lozove, Krymske, Novoluhanske, Syze, and Novoleksandrivka came under hostile fire of grenade launchers and small arms,” the ATO spokesman added. In Donetsk sector, Russia-backed militants committed nine ceasefire violations. “Militants attacked Ukrainian positions near Pavlopil with heavy machine guns and small arms during the dark time of the day, they later fired 10 rounds from Minsk-proscribed 120-mm mortars,” Colonel Motuzyanyk said. Russia’s proxies also used grenade launchers and small arms near Krasnohorivka, Bohdanivka, Avdiivka, Pavlopil, Kamianka, Maryinka, and Pisky. Ukrainian troops returned fire. Report on the military developments as of November 30 is available here. Interactive data on the shelling: chronology shelling chart and the interactive map.